E-Gov Services turns an ordinary website into a powerful tool. 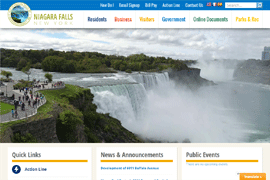 Website Redesign with Content Management puts city staff in control of a great looking new website that’s easy to use. E-Gov ParksLink gives the city better control of recreation programs while giving the public the ability to register and pay online for classes, facilities, pool passes and more. E-Gov PermitsLink lets the city manage the whole building permits process including applications, fees, reviews, inspections, forms, and reports.